These tormenting spirits (incubus and succubus) are responsible for destroying marriages, hatred by earthly spouse serious gynecological problems, Marital distress, miscarriages, impotence, untold hardship, and general failure at the edge of breakthrough. Prayer Line – Baptism of Fire on Sustained Fire to Demolish Strongholds. A time of daily prayer and warfare. Print this weeks prayer points below. 11pm – 12.30am US CST. 9pm – 10.30pm US PST. 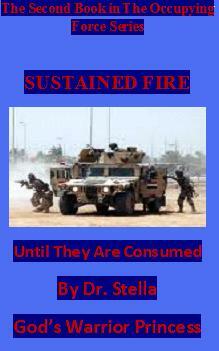 SUSTAINED FIRE – UNTIL THEY ARE CONSUMED. This second book of the occupying force series “Sustained Fire” is about invading the camp of the enemy and recovering what he has stolen. This is a must read for anyone who wants to know how to gather SUSTAINED FIRE for the intense warfare of this season. Do you want to learn how to fight and win from a seasoned warrior. Download your copy of this E-BOOK now. Click Here To Listen To Message on Destroying Witchcraft. Witchcraft by definition is the act of using magical powers. It’s also described as seductive charm or influence. Anything that involves supernatural powers is either of God or of the devil. When it’s of God its good. When it’s of the devil its bad. As simple as that. Sustained Fire to Demolish Strongholds. A time of daily prayer and warfare. Print this weeks prayer points below. We started a prayer progamme called sustained fire in the ministry. We will be praying daily from 11pm central time to about 12.30am. Praying fervent, hot prayers continually and on a daily basis will demolish any stronghold, solve any problem and bring down any mountain. Join us saints. 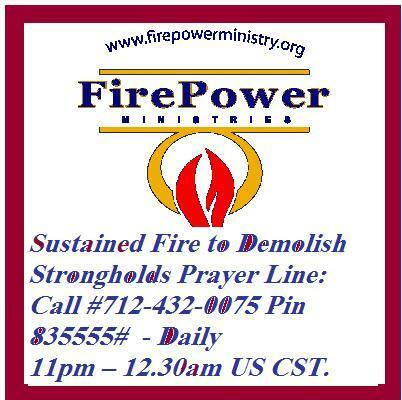 Prayer Line: Call # 712-432-0075 – Pin 835555# – Thursdays 10pm- 12am US CST. To download our messages go to http://www.etunes.doweta.com. Click below to playback this message. Jesus Help! The Church has been caged! For years America seemed to enjoy a good foundation of having been founded on biblical principles. Even though the founders had a lot of cultic links with Masons etc. the grace of God was upon this nation and we prospered both physically and spiritually. That grace came because scripture was in the foundation of our structure. Many laws in America are actually biblically based. America became an epitome of freedom and Godliness. When the devil tried to bring Satanism and demonic stuff in this country it was resisted. People fought for their right to worship God. That same freedom was turned around to bring in everything, good and evil. If we do not guard the Good we stand for it will always be at risk of perversion by the devil. When the devil could not bring down America by popular vote he went on a subtle plan to attack on all fronts. The attack was multifaceted to bring down all the systems of this nation, the legal system, school, family, medicine, media and fashion. This attack was spiritually stirred by a demonic revival. America over recent years has become one of the most demonized nations in the world. Not only have we accepted it, we have legalized it. America has brought in witchcraft for diverse areas and made it a religion. Now witches have the same right to evangelize in prison as do pastors. America celebrates a day in the fall reserved for witchcraft and evil and even Christians dress their children like demons and send them out to get candy from all kinds of people thereby initiating them into the occult through food. There have been satanic fasting and prayer and spells in diverse places designed to put the church in slumber. So, while the American church has slept the enemy has taken over on various fronts. For the eighteen years I have lived in America I have never seen this level of demonization in Christians until now. I have never a seen a time in when things were so hard, people so oppressed and in the midst of that, the church so prayer less. Even for seasoned prayer warriors it’s a task to keep a healthy prayer life because of the territorial oppression. Most churches operate on one to two hours of prayer a week, having replaced prayer with entertainment. So, while the devil is singing ‘Rock – a- bye -baby’ to the slumbering church all the other fronts are demonically prospering. Saints, we have been caged! Thursdays 10pm- 12am US CST. 1) I paralyze all aggression addressed to my star in the name of Jesus. 2) Lord, bring honey out of the rock for me this month. 3) Lord, open up all the good doors of my life that household wickedness have shut. 4) Let all anti- breakthrough designs against my life be shattered to irreparable pieces in the name of Jesus. This second book of the occupying force series “Sustained Fire” is about invading the camp of the enemy and recovering what he has stolen.This is a must read for anyone who wants to know how to gather ‘SUSTAINED FIRE for the intense warfare of this season. Do you want to learn how to fight and win from a seasoned warrior. Download your copy of this E-BOOK now. Click Here to download your copy of this fire. book.